This case study explores Longquan's community forests in Zhejiang Province, China. It uses reliable references and documents to explain changes in tenure in Longquan after 1950 and how villagers use new implications to improve their life. A long period of poor life forces central governments make a change and Longquan get the chance become better. After hard exploration, the new policy: Household plots and responsible mountain system came out. It gives every house use rights to a specific area of forests and villagers who have extra energy could take responsible mountains from communities. There are the analysis of stakeholders who are involved in new implications in this paper. One of the new implications, right mortgage loan gives villager a chance to rent their household plots or use the forest as collateral for a loan. Another implication, forest nurse, could help villagers manage forests. The new policy miraculously activates local economy. Moreover, local people began to attach importance to protect forests because the quality of their forests relates to income. The connection between forests and residents become much closer. Everything develops in a better way. However, there are still some conflicts about territories between communities. Satellite of Longquan. Map data: Google, DigitalGlobe. Longquan is a county-level city and former county under the administration of the prefecture-level city of Lishui. It has 444 villages and 12 communities. Longquan city is in the southwest of Zhejiang province, with a total area of 303,900 hectares and a forestry land of 259,900 hectares, including a woodland area of 227,100 square hectares and a shrub-land area of 8,200 hectares. Among the woodland, there are 155,200 hectares timber stand, 25,300 hectares shelter-belts, 2,500 square hectares special forests, 35,100 hectares bamboo forests, and 9,000 hectares economic forests. The total amount of live wood accumulation was 1.018 million cubic meters, with 38 cubic meters per capita and 77.4% of the city's forest coverage. Longquan is surrounded by hills, and was isolated before 1981. People in Longquan got benefits from the abundant forest resources for hundreds of years. However, this situation could not last anymore. Cause the tenure and property of forests were chaotic, a forest always has several owners. And there was no specific regulation to rule people which lead to degeneration of forests in Longquan.People in Longquan were live in poor life between 1950-1980. 1950-1953: Local people in Longquan owned private forests without regulations. They could do whatever they want. 1953-1956: Except for private gardens and household plots, all individual forests became collective forests. 1957-1980: There were only State forests and collective forests. 1980-2018: Local people and farmers got household plots and responsible mountains. Same as Naidu, the tenure and property of forests in Longquan before 1981 was chaotic because of the improper leadership. 1950-1953: After the implementation of the 'Land Reform Law of the People's Republic of China,' large forests, wasteland, and barren mountains in the whole country have been nationalized. In Longquan, through the land reform, the local people got the individual forests. And villagers can freely cut, utilize, sell and give away their freehold forests. Villagers had legal rights to their individual forests. 1953-1956: Since 1953, the 'cooperative movement' in Longquan has begun. The work of joining the communal forests has been carried out. The individual ownership of mountain and forest was transferred. The local people only retained the ownership of the trees on the hills and the trees in front and behind the houses. Their ownership of the mountains and the lands is converted to collective ownership by the cooperative. 1957-1980: Since 1957, the situation got worse. Through the implementation of 'Rural People's Communes article sixty-one,' farmers have been forced to join the people's communes and all the mountain forests of the previous cooperative have been owned by the communes. During the Cultural Revolution, the countryside began to merge with society and carry out the movement of 'cutting the tail of capitalism,' confiscating the residents 'self-retaining mountains, land and trees.' As a result, only the state and cooperative had the legal right to forests, trees and forest products. The villagers in Longquan shared everything in this period. In 1981, the forestry 'three-fix' reform, with the main contents of 'stabilizing mountain rights and forest rights, delimiting household plots, and determining the responsible mountains system.' This is the beginning of the diversification of forest resources ownership in Longquan. In 1981, the central government promulgated the Decision on Several Issues Concerning the Development of Forestry by Protecting Forests (No. 21 of the Central Committee 1981.) The vast number of villagers were assigned to the household plots and contracted to the responsible mountains. Forest right management center associated with village committee to divide household plot for villagers based on labour force. 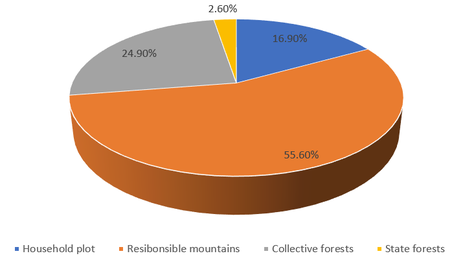 During this period, 72.5% of collective forests are transferred into household plot and responsible mountains. The policy of opening up the market and afforestation to the household in collective forest areas has enabled farmers to have more adequate forest land management rights and forest ownership. However, due to the failure to keep up with the supporting policies and the lack of the recognition of new policyl, there is a seriou deforestation in the Longquan. Between 1981 and 1984, Longquan began the first step of revolution. Trying to stabilize the property of forests, ensure the household plot area, and confirm the Forestry responsibility system. After three years, there were 437.4 square kilometres household plot area, 1439 square kilometres responsible area, 644.5 square kilometres collective forests area and 67.3 square kilometres state forests area. Household plot Household plot was the land which community allocated for each local people during the 'Three-Fix' period. Communities has the ownership of this land, but each household has use right to forests and all production of the forests. This land could be inherited and transferred. Government and communities could not take it back. Responsible mountains Responsibility mountains is the land which rural community divided barren mountains and a part of old collective mountains to each household during the 'Three-Fix' period. Communities has the ownership of this land, but each household could manage it. The production in old collective mountains belong to community and the production in barren area belong to individual. Collective forests The forests belong to a community, each member in this community has equal legal rights. Community has the legal ownership of the forests, and all production in the forests belong to villagers. State forests The forests belong to the country. State has legal ownership of the forests, and people who has license has use right. Longquan city has set up a Forest Right Management Center, Forest Resources Storage Center and Forest Assets Evaluation Agency to actively promote the circulation of forest resources. 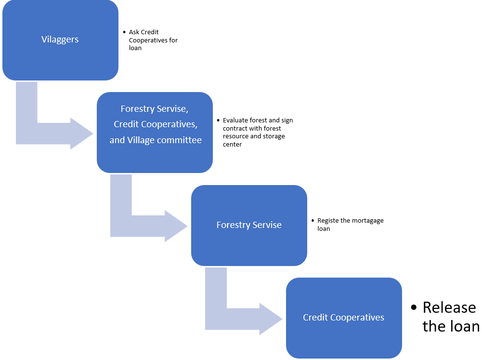 Basic program in forest right mortgage: Household plot owners go to Credit Cooperatives apply for loans. Credit Cooperatives, Forest Service, and Village Committee mortgage evaluate the household plot and sign entrust guarantee contract with Forest Resources Storage Center. After the forest right mortgage registered by the Forest Service, Credit Cooperatives would release the loan. The loan term is tentatively set as one year and the loan limit is temporally set as 50% of the assessed value of the mortgaged right. Within the term of the loan, the mortgaged property shall still be managed by the owner of household plot and supervised by the Forestry Service. During the mortgage loan period, no person or governmental apartment could issue the tree cutting license without the consent of the villager. Also, they have no right to transfer the household plots. Over 30% of dilapidated houses in Xiangbian, Anfu, and Daqiu villages were rebuilt through the right mortgage loan in 2009. It solved financial problem by around one million RMB which villagers got from loan. Nengfu company through the Forest Rights mortgage loan 12 million yuan, cracked the capital problem. In the severe situation of the financial crisis, foreign trade exports still had growth trend. The foreign trade exports reached 16 million U.S. dollars in 2009. The per capita net income of rural residents in Longquan reached 8,025 yuan, an average annual increase of 19.7 percent compared with 2008. The guarantee mechanism is not perfect, and the degree of marketization is not high. Due to the uncertainty of the preservation of forest resource assets, it is difficult to realize the acquisition, storage, and realization of mortgage assets after some borrowers fail to repay their loans due to investment failure or death. Some forest farmers have a weak sense of integrity. At the same time, the evaluation and guarantee of forest resources and assets do not have the market-oriented operation of social service intermediaries, which also affects the smooth and healthy development of forest right mortgage loans. All these problems cause the overdue. Longquan has occurred 44 forest rights mortgage loan overdue which value 3.14 million yuan. Credit cooperative made efforts to deposit the realization of 18 overdue which value 1.15 million yuan, but there were 1.99 million yuan which have not been disposed of the realization. All villagers in Longquan get legal rights to a piece of land. And all of they aware the importance of protecting their land. But there was an embarrassing situation: each family only has a proper area of forest, which means they can live well with their forest, but it's impossible to become a wealthy man with it. And people were afraid that if they go out for business someone would log their trees and steal their forestry resources. Therefore, a new system came out, “forest nurse”, helping people take care of forests. Equity joint 'forest nurse' Villagers or communities provide lands and companies provide money to manage the land. The tenure of the land will not change. Companies in charge of selling the products of forests, and net profits will divided based on stocks. Companies have the best skills on how to make the biggest profits, and villagers would receive the economic benefits. In addition, villagers don't have to spend time on managing the forest. These companies are in interested group, they come to make profits and they would not care what's going on in the forests. Communal 'forest nurse' Villagers who selling the same type of forestry products voluntarily come together and make up a mutual-helping group. All the forests are managed by members together. Partial turn from the price-taker to price-maker. Because this is a voluntary group without strict regulation, sometimes member would have conflict opinion on how to manage the forests. Lease type 'forest nurese' Villagers rent their forests to others. And tenant could manage and sell products. Villagers are totally free under this type of 'forest nurse', they can begin other business. May cause strong competition on renting the forests. Shui Zhou, a famous forest nurse in local, combines three types of forest nurse to manage around 14,000,070 square meters low-productive forests and barren mountains from 132 households, 9 villages. His job is forestation. To improve the quality and quantity of production from these forests, Shui Zhou employs villagers who have rich experience with forestation to help him manage the mountains. Most of the forests he managed belong to villagers who go to city for a job. Without Shui Zhou, these forests would be logged by outsiders or degenerate. After Shui Zhou's professional management, these barren mountains appears green species and primary forests. Till now, the value of these forests reach 16,000,000 RMB. The central government of China would release brief policy contain the main direction of development. And local government would based on their unique situation to make adjustment. In Longquan, there is a forestry bureau which manage all stuffs about forest. To fit the villagers needs, Forestry bureau sets five departments. 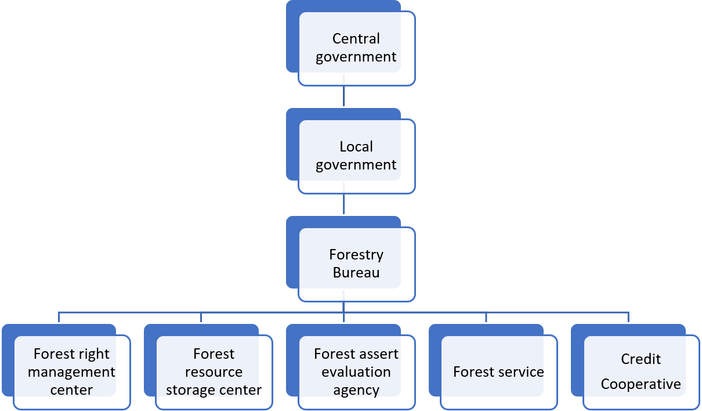 Forest right management center, forest resource storage center, forest assert evaluation agency, forest service, and credit cooperatives can provide specific services for villagers and companies. These five departments have different function, but some of them are overlapped. PS: Part of these five departments' function are present in Implication section. Village committee is elected by villagers, their job is protecting villagers' rights. And they helped Forest right management center divide household plots and responsible mountains during 1981-1984. Villagers who don't rent their household plots: They live in village and their forests are the only thing they depend on. They really care about what's going on in their household plots, because their life would be directly affected by forests. Owners of lease type 'forest nurse': Owners get the legal rights of these forests, and they have the same role as villagers who don't rent their household plots. Owners of communal 'forest nurse': The mutual-help group is come up with villagers who want to have a better price of their forest production. And These forests belong to them, they care about these forests. Moreover, they have more power than individual. Village committee: They represent the villagers' rights and prevent outsiders logging in villagers' household plots. They have power to make negotiate with governments. Villagers who rent their household and get another job: They get rental and do not care about forests. Villagers who get right mortgage loan: They get the loan to start their own business and leave their forests alone. Credit Cooperatives: Provide financial support for villagers. And do nothing with forests. Companies in Equity joint 'forest nurse': Make profits from the forests, and they can go anywhere else. Workers in Forest Right Management Center, Forest Resources Storage Center and Forest Assets Evaluation Agency: Just take the salary and work here. To provide villagers' legal right to the forests and make sure everyone owns forest, governments released the new policy and made tenure change. This tenure change clear forestry property rights. The new tenure arouses villagers' enthusiasm of protecting the forests, and activates forestry management mechanism. It unifies the archiving and preservation of forest ownership data and establishes the foundation of forest right management system. Mediation of a large number of forest disputes, effectively maintain the social harmony and stability of forest region .However, some villagers can't manage their forest well and cause the degeneration. Some villagers don't want to make a live with forest, instead they want to do something bigger. Meanwhile, villagers only have forests resource which need time to earn money. Although the tenure change have improved villagers' life a lot, there were still some problems need to be solved. Therefore, villagers and local governments come up with some new implications. 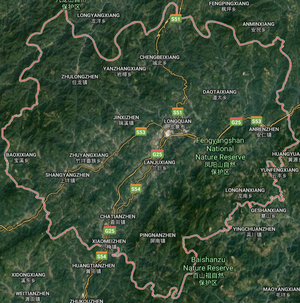 Longquan is located in a mountainous area, in the southwest of Zhejiang province. One of the important problems of Longquan development is the difficulty in obtaining loans.Through this measure, the forest right is taken as the carrier of mortgage financing to transform resources into capital, and makes the forest right certificate become the "credit card" of forest farmers, and the forest becomes the green bank. It can transform the potential resource advantage into the actual economic advantage. This new implication of forests promotes the financial development of Longquan and help villagers get out of the small town. The new implication give these people who have wild ambition a chance to make their dream come true. The regulations of this implication are not comprehensive enough. And the process of replying the loan is pretty complete, some villagers enough don't know how to reply. After the tenure change, everyone owns household plot. However, some of them would like to do other business rather than make profits from the forests. To make these people free and avoid degeneration of these forests, 'forest nurse' came out. To some extent, it can reduce the disputes between farmers and promote the popularization of forestry technology. This implication collect individual forests to one person or group. Turn from the small-scale forest management to large-scale forest management. Not only improved productivity, but also improving local people' life quality. But it will make individual villager become hard to compete with them. In some villages, the village committee use the name of the majority consent of the village committee or villagers' representatives to get back villagers household plots. Some village committees have different ideas about the policy of 'never change household plot,' they want to redivide the mountain according to the current population. When a villager's household plot is requisitioned or rented, the requisitioned and leased money allocated by the government would be collected by village committee. Longquan need to make full use of the radio, newspaper, television and other media to publicize policies related to the new forest rights system. Local government should Increase the enthusiasm of villagers in participating in democratic decision-making on the management of collective forest resources, and increase their awareness of protecting forest resources. Increase villagers' awareness of the benefits of right mortgage loan and convince them that local government are reliable. Improve village committee's law-abiding awareness and teach them protect villager's rights. Complete the regulation of forest right mortgage loan, and improve workers efficiency. Set up a apartment to supervise villager committee. The relevant information of the ownership and use right of household plots, collective forests, and responsible mountains should be saved online and anyone could have a access to the information. Establish complete electronic archives and convenient management system to improve the work-efficiency. Use the satellite to measure the boundary of household plots, responsible mountains, and collective forests. And put the map online. ↑ 5.05.1 Hong, R. (2012). Study on the reform of forest rights system in longquan city. (Doctoral dissertation, 浙江农林大学). Retrieved from http://xueshu.baidu.com/usercenter/paper/show?paperid=9a4b3d7218b9c8e2c1b45527c8e2f4fd&site=xueshu_se&hitarticle=1农林大学). This conservation resource was created by Lingsen Kong. It has been viewed over 0 times. It is shared under a CC-BY 4.0 International License.